This morning we went into Roquetas to see if the last part of the exhaust that we had ordered had arrived. It had not. Easter is now upon us and businesses close at lunchtime Wednesday until next Tuesday. If we waited any longer it would be another week, so we decided to forego our deposit and be on our way. The road to Valencia is not terribly interesting. Eventually it becomes a series of high-rises by the sea. The perfume of orange blossom near Valencia was lovely. We visited Pat and Brian in Oliva and caught up on all their news. We decided not to stay at the same campsite though as the price for the camper was 28.95 euro per night, that is without the per person charge and electricity! Instead we went to a spot recommended by Brian where there were supposed to be many wild campers. There was nary a one in sight. Presumably they had been moved on because it is Easter and the coast becomes choc-a-block then. Once again an uninteresting drive. 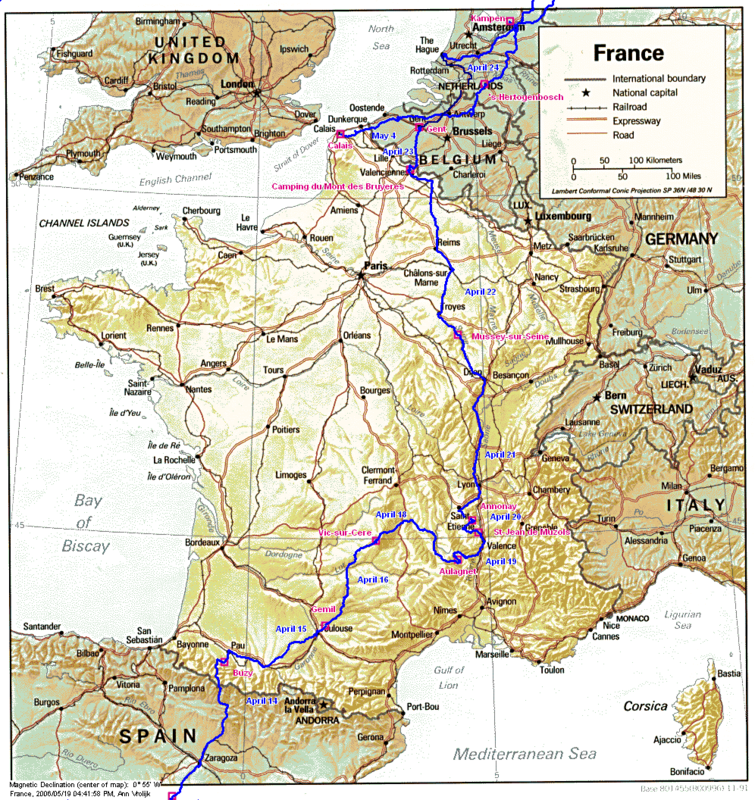 We turned inland towards the north-west border with France. The road goes over a plateau, lots of flat country with hills in the distance. There are ski resorts around though. We camped off the road up on a hill with a long view over the country-side. Today we went over the Pyrenees. The Spanish side was relatively dry. Around Con Franc on the border there were many walkers, hikers and cyclists out enjoying the long weekend break. There were also skiers using the last of the snow at the resort. Most of the snow has gone and what is left is making rivulets down the mountain side. France is over the top of the Pyrenees and almost immediately there was a difference. The French side has deeper valleys, sometimes the road almost scraped each side of the pass, the valleys are so narrow. The farms are closer together, neater, greener with slate roofs (not tiles) and made of stone. The number of road deaths are advertised and the roads were not as good as in Spain. There were also a lot less cars on the road. The weather is milder. In Spain it was either hot or cold, in France it felt somewhere in between. We stayed in a "camping-on the-farm". Very peaceful. We are now in wine country with sales at the local chateaux. We stopped at Cordes-sur-Ciel, a reasonably well preserved medieval village. There was a tourist train about to depart from the parking area going up to the village. It saved us the hard uphill walk, however we did walk down again, giving us some exercise for the day. The village was founded by the Count of Toulouse in 1222 during the crusades. There are many similar villages in the area showing the typical wood and plaster construction of Tudor England. We stayed in a municipal camping to catch up on the washing. Monday was a lovely sunny day. Today we drove into the Ardeche region with its 42 museums, 13 monuments, 17 castles. 8 caves open to the public, some used by humans in the past, 13 general tourist sites and 9 natural tourist sites. It offers hiking, canoeing, horse riding, rock climbing, skiing, caving, boating, fishing, mountain biking and aerial sports. It has magnificent landscapes as well. In places it is like looking down on the world. The villages we drove through were very quiet, hardly a soul to be seen. It seems they all sleep during the week and come out on the weekend. What a life! Today we used the Touratech software for the first time to see exactly where we were. Usually we only use it to plot where we have been or set up routes. Since we were on a very quiet road which, along with the villages we were passing through, was not on our paper map, it was extremely useful to show the direction we should follow. We have not bothered to set up routes in Europe, merely following signs or our noses. We stopped off to look at the Cascade du Ray-Pic. This is a geological curiosity as it is was created from a volcano that pre-historic man would have seen in activity thousands of years ago. The water runs out of a basaltic overflow 60 meters high. We stopped at the first notice we saw and I started hiking to the falls. Although the path was well marked and had recently been cleared I only got halfway before turning back. A short time later we came to another indication, the official entrance. Here the path was very well prepared, wide and sometimes paved. This time we both went . We stopped in Lalouvesc and went into the St Francois Regis Basilica. It was started in 1864 and completed in 1877. The reliquary with the remains of St Regis lie here. The stained glass windows tell the story of St Regis. The village was nice to walk around. The exhaust was fitted on time and we were away by 10:00 am. Drove through Bourgogne wine-lands, the area of the grand cru wines. The area is not yet green as the vines do not have leaves. The fields were being ploughed by tractors with very high ground clearing to allow them to pass over the top of the vines. More flat country today with a lot of 13 to 16th century churches open to the public. I have recently read a book about Joan of Arc and particularly wanted to visit Rheims Cathedral. It stands at the end of a wide avenue and is impressive. The exterior is from the renaissance and is intricately decorated with many statues, large and small. The interior is plain and disappointing after the promise of the exterior, not surprising as the current building was started in 1211 and the exterior added in 1481. The Cathedral is dedicated to Mary, Mother of Jesus and was consecrated in 401 on the site of earlier roman temples. In 1429 Joan of Arc brought Charles Vll here to be crowned as it was the traditional place for the ceremony. Today was cloudy. We stopped in Gent to look for a Goma air rifle, however the prices were quite high. This involved driving to, then walking around the old town. The directions to the shops included the instruction to turn at the castle. This did not really make sense as we could not see one - until we were on top of it! The castle was built in medieval times when Gent was commercially vibrant due to the maritime trade. Pieter purchased an air rifle today in The Hague. It does not require a license and can therefore be taken through borders. He also ate his last salted herring for a while. I enjoyed the daffodils sprouting joyfully through the grass on the verges. These are left in the ground and multiply each spring giving an ever more spectacular display. This morning was spent sorting out the carnet on the landrover, pension issues and visiting friends. Then it was into Groningen to visit family. Thanks once again Harjet and Kees for our stay in your private 5 star hotel! The walk about which Queen Beatrix goes on each year on her birthday was televised. This year she, her sons and their wives walked about in Almera. It was fantastic to see how enthusiastic they were about the various activities and displays put on for their benefit. They tried some of the games, sometimes losing, and generally appeared to have a great time. The people were also very enthusiastic. I cannot see the British Royal Family being so familiar and involved with their subjects. Sunday we all went for a drive to Termunterzijl on the Waddenzee near Delfzijl. The walk on the dyke with the sheep was bracing in the icy cold wind. At least it stopped raining during our walk. There is a restored 13th century church which we walked around discussing the difference between restoration and rebuilding. No conclusion was reached on which parts of the church had been restored (i.e. patched and cleaned) and which had been rebuilt, nor on what the difference between the two terms are. Germany could be seen across this section of the Waddenzee. The Gemaal Rozema pump station nearby pumps the excess fresh water into the sea even if the sea level is higher than the fresh water level. At low tide the Wadderzee bottom is exposed. The wadder is basically the level mud shelves between the mainland and the islands on the outer-side of the Wadderzee - less salty than the North Sea it is a world Heritage Sight / Nature Reserve. The drive today was very short but we wanted to visit Chris and Koosje whom we had met in Spain. The weather was wet and cold, the visit warm. There are a few days to spare so we decided to see a little part of Holland. We drove through the flat countryside interspersed with farmhouses and trees to the town of Kampen. It used to be a major port on the Ijssel River and is now a tourist village. We walked around and enjoyed the atmosphere. The Kroller-Muller Museum is in the Hoge Veluwe National Park just north on Arnhem. Helene Kroller-Muller began to collect art at the beginning of the 20th century. She was attracted to the avant-garde art of her own time and wished to make this more easy to understand by showing it together with old masters. The museum opened in 1938 and her successors have continued with the same policy. The collection provides a comprehensive picture of developments in the visual arts over the last 150 years. It is the major Vincent van Gogh museum in Holland. Access to the museum is through the park with a choice of taking your car in or walking or cycling the 3 kilometers from the entrance. We decided to walk in. The park has many trails. wildlife, the Museonder showing life beneath the earth and the St. Hubert Hunting Lodge. There is plenty to do for all the family and is quite busy. However, we were only interested in the art museum. It took us 3 hours to go through and was very interesting especially for Pieter who studied art. We now have a print of van Gogh's "drawbridge in Arles" in our van. We rode back on the free white bicycles that are available in the park. That only took about 10 minutes. It was great fun, I have now accumulated about 1 hours experience on riding a bike in my life. I am sure with a little bit more time I may be able to stop wobbling, turn corners without hitting anyone and not fall off. Maybe one day. We spent the night crammed into a campground where most caravans are fixed in place and rented. First stop was at Girax In Lichtaart (just south of Turnhout in Belgium) for an air compressor. The one we bought in SA packed up long ago along with the others we purchased subsequently. This compressor was recommended on www.sahara-overland.com. Then on to Dunkirk to price the ferry to England followed by Calais. We decided to go via Sea France from Calais. The Norfolk line from Dunkirk was 10 euro cheaper if you went in the middle of the night. P&O from Calais was the same price. The hovercraft company has folded since we went across in October. We spent the night in Calais town square.